‘The Wolf of Wall Street’ has been criticised by ADI for featuring a chimpanzee ‘actor’ – who can be seen in the trailer wearing roller skates and clothes – ahead of its release in the US on December 25th (UK release January 17th, 2014). ADI has written to the movie’s director Martin Scorsese and star Leonardo DiCaprio, revealing the horror of life for animals used in movies and urging them to pledge not to work on films using live animals in future. They have also called for the scene to be cut from the DVD. The young chimpanzee used in the film, named Chance, is kept at the Big Cat Habitat and Gulf Coast Sanctuary in Sarasota, Florida. In addition to being hired out for films, Chance is forced to ride ponies, dress in clothes and endure long journeys to perform at fairs and events as part of the travelling circus, Rosaire-Zoppe Chimps. The intelligence, emotional capabilities and social needs of chimpanzees are beyond doubt and the argument against their use in movies and circuses is overwhelming. ADI investigations reveal that discipline and abuse can be kept hidden off-set, while the animals are being trained or kept isolated in their cages. 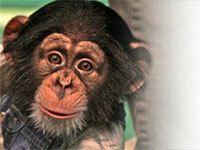 Please help us end the use of chimpanzees and other animals in entertainment.